Italian sculptor. He spent four years working for the sculptor Antonio della Porta. From 1497 to 1501 he collaborated with Giovanni d Aria (fl c. 1490-c. 1508) and his brother Michele d Aria (fl c. 1466-c. 1502) on the marble tomb of the brothers Agostino and Giovanni Adorno in S Gerolamo in Quarto, Genoa (fragments in situ). As a result of the French occupation of Genoa (1499-1508), he received a number of important commissions from French patrons and was therefore instrumental in introducing the Italian Renaissance style into France. There is, however, no evidence that he himself ever visited France. In 1502 Louis XII commissioned a tomb in honour of his ancestors the Dukes of Orlans from Viscardi and Michele d Aria in association with the Florentines Donato Benti and Benedetto da Rovezzano. 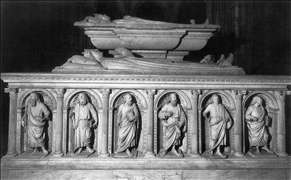 The marble monument, now in the abbey church of Saint-Denis, was originally set up in 1504 in the Celestine Church (destroyed), Paris; it combines a typically Italianate base in the form of a sarcophagus surrounded by small statues of apostles in niches with a more French style for the four reclining figures of Louis, Duke of Orlans (1372-1407), his wife Valentina Visconti (1366-1408) and two of their sons, Charles, Duke of Orlans (1391-1465) and Philippe, Comte de Vertus (1396-1420). In 1507 and 1508 Antoine Bohier (c. 1460-1519), Abbot of Fcamp, who had accompanied Louis XII to Italy, commissioned from Viscardi an altar, a tabernacle, a reliquary and two statues of saints (all marble); though damaged, these remain at the abbey church of La Trinit, Fcamp. Viscardi is documented in Genoa until at least 1522, working at the Palazzo Spinola in 1516 and at the churches of S Lorenzo and S Domenico. With the possible exception of a marble tabernacle from the latter (fragment, London, Victoria and Albert Museum) none of this later work is known. See more details about "Tomb of the Dukes of Orleans"